Three founding partners with established practices in Chittenden County–Hannah Rabin, MD, Gil Theriault, MD and Dan Goodyear, MD–established Richmond Family Medicine, a practice with the goal of being a true "Medical Home" for patients from all walks of life. With a characteristic independent and hands-on approach, the doctors, working alongside and overseeing a construction crew, renovated an 1840’s brick house and designed and built an addition to accommodate the medical office on Main Street in Richmond. 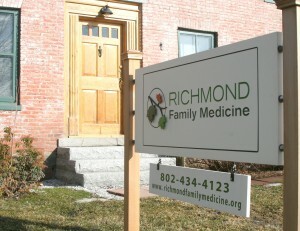 At a time when medical care is increasingly provided by big medical organizations, the doctors who founded Richmond Family Medicine chose to start a small independent medical practice to provide up to date and personal primary health services to people in the town of Richmond and surrounding communities. Dr. Rabin explains, "We believe that people want their doctor to know them, to know their family and where they come from. Local doctors improve access to primary health care services which encourages people to get the care they need. We strongly favor a close doctor-patient relationship and continuity over many years because that helps us to work with patients to live healthy lives, to prevent, diagnose and treat disease, and to provide information and support to patients as they make medical decisions that are appropriate for them as individuals." Dr. Rabin says, "This collaboration makes the work fulfilling for the medical staff at Richmond Family Medicine who continue to learn and support each other professionally, and it enables us all to provide excellent care to patients." This collaboration, combined with our passion for high quality and evidence based care have enabled us to become certified as a Level 3 “Patient Centered Medical Home” (PCMH) through the Blueprint for Health initiative, and the National Committee for Quality Assurance. We take enormous pride in having achieved and maintained this highest level of certification. Patient-Centered Medical Home™ (PCMH™) is a trademark of the National Committee for Quality Assurance.